In a medium pot, bring 1 Tablespoon of olive oil to medium heat, then add couscous. Stir to coat the couscous and cook for 3-5 minutes until the couscous begins to smell slightly fragrant. Keep an eye on it to prevent burning! Add water and bring to a boil. Once boiling, decrease to a simmer and cover. Cook 10-12 minutes, stirring occasionally, until the water has all been absorbed. Set aside and allow to cool for 5-10 minutes. While the couscous is cooking, you can mix up the dressing! In a mason jar (or bowl), add 2 Tablespoons of olive oil, lemon juice, salt, and pepper and mix until well-combined. 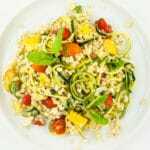 In a large bowl, combine zucchini, corn, tomatoes, feta, jalapeño, and basil. Toss to combine. Add cooked couscous and toss again.